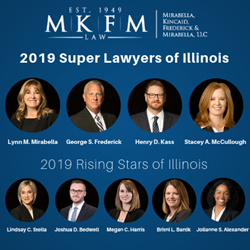 Mirabella, Kincaid, Frederick & Mirabella, LLC, is proud to announce that Super Lawyers has selected 9 of the firm’s attorneys for the Super Lawyers and Rising Stars lists for 2019. ● Attorney Henry D. Kass was selected for the fifth consecutive year. He practices family law and criminal defense. ● Attorney Stacey A. McCullough was selected for the first time. She practices criminal defense, juvenile law, and school law. ● Attorney Britni L. Bartik was selected for the second consecutive year. She practices family law. ● Attorney Jolianne S. Alexander was selected for the first time. She practices employment law. Founded in 1949, Mirabella, Kincaid, Frederick & Mirabella, LLC has grown to be one of the premier law firms in the DuPage County Area. MKFM, with offices in Wheaton and St. Charles, represents clients facing legal matters in family law, divorce, sexual harassment, employment discrimination, criminal defense, guardianship, adoption and school law. Specifically, the firm offers legal guidance for spousal maintenance, child support, allocation of parental responsibilities, property division, and visitation/parenting time. For unparalleled legal representation, contact Mirabella, Kincaid, Frederick & Mirabella, LLC at 630-665-7300 or complete and submit our online contact form to schedule an initial consultation.